Honeycomb core cutting tools for phenolic, fiberglass, aramid, aluminum and plastic. Including composite laminate skins. Machining honeycomb core? Cut through it with ease. Serious options. For serious work. 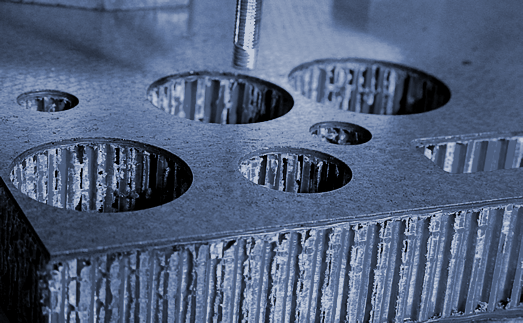 For rapid machining of large honeycomb structures, choose from our range of muncher and hogger tools. Want even more options? See our extra range of precision routers for machining slots, pockets and recesses in honeycomb core. Harness the power of FIBROCORE™. For all the things you want to do. Cajero’s new HM-Type exchangeable munchers, cutting knives and saws give you the greatest choice — and the smallest inventory. When you need to machine honeycomb for longer, turn to Cajero’s new HGR-Type hogger. With our exclusive wear-resistant coating, you benefit from up to 50% greater tool life. Even though it’s skilled at chamfering and fine machining honeycomb core, Cajero’s AKS-Type tool is still sleek and compact, to protect your machine spindle. Cajero’s category-defining AHM-Type Honeymill™ makes your aluminum honeycomb core components look great. The features you need. The quality you want. Phenolic, fiberglass, Nomex® or aramid. Machine them all with Cajero’s NHM-Type Honeymill™ for non-metallic honeycomb core. Composite honeycomb sandwich panels. Delamination-free. No matter the task, Cajero’s ONH-Type Honeymill™ is up to it. Imagine being able to machine your honeycomb cleanly — and get delamination-free composite skins too. Not only can you machine aluminum honeycomb effectively with Cajero’s OSRA-Type Honeymill™. You can also produce a burr-free finish on aluminum skins, or a delamination-free finish on composite skins.